Christmas is perhaps the most extravagant holiday out of the whole year. Some people go to great lengths to decorate their homes in the best holiday decor to enhance the festive holiday spirit. But with the tough times these days, every penny counts and cheap store bought decorations are just too tacky. 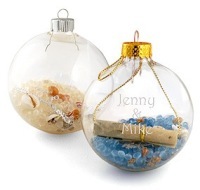 So why not save up on some money and be unique by making your own homemade Christmas crafts? Don't be worried about the word homemade though. Just because you need to do these homemade Christmas crafts all on your own doesn't mean that they're labor intensive. If you're ready to make your own unique holiday decor, here are some ideas for homemade Christmas crafts. Make spice candle. The idea is to add cinnamon sticks or star anise pod around the candle. Here is you gonna do. Dab melted wax using cheap paintbrush around the candle and press the cinnamon sticks or star anise pods. Cool it down and once again dip the entire candle (I suggest you hold the wick) to melted wax. Make sure you cover all the area. Then cool it down before you tie it with ribbon. 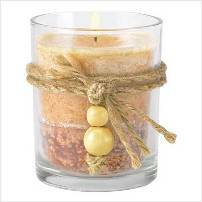 Similar to this, you can also make a potpourri jar "candle". All you need is a large jar, a strand of cool white Christmas lights, dry potpourri, a 6-inch doily and a ribbon. 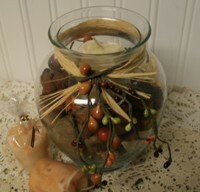 Start off with this craft by putting potpourri at the bottom of the jar and layer in the lights. Make sure that the plug end is outside of the jar. Once the lights are in, weave the ribbon through the doily and tie it around the opening of the jar. Once you plug in the lights, the scent of the potpourri will fill the room. You can also add essential oils for a stronger scent. Going on with the theme of aromatherapy, you can also make some herbal tree decorations. You can make these by simply filling clear glass ball ornaments with colorful spices like cloves, different colored peppercorns, star anise pods, cardamom pods. Other herbs and spice are welcome as long as it reflect the theme of christmas. You can also make a spice garland by stringing cinnamon sticks, chili peppers and star anise pods on twine. Other herbal tree decorations ideas is make fragrant sachets by cutting fabric into fun shapes such as reindeer, santa hat, snowman and filling them with herbs and spices that are fragrant. Have fun with the ideas. Christmas recommend herbs and spices are frankincense, myrrh, rosemary, cinnamon sticks, star anise pods, cloves, ginger, orange slice. And here's another budget idea for you. Since the Christmas season really just lasts for about a month, you can recycle all your holiday greens like wreaths, garlands and even your Christmas tree, and make some potpourri that's suitable for the rest of the year. Dry your greens thoroughly. After that, cut the greens up into 2 to 3-inch pieces using clippers. In a large bowl, mix together 6 cups of the dried greens and add a number or all of the following in 1/2 cup amounts broken cinnamon sticks, cloves, allspice, crushed nutmeg, broken bay leaves, star anise, small pinecones, dried citrus slices, citrus peels, holly and juniper berries, and lemon balm leaves. To enhance the scent that your potpourri will give off, you can add some essential oils and a fixative. Depending on the oil you use, you can make either a Christmas scent for that festive feeling all year round or make kitchen potpourri. Fixatives like oak moss and orris root chips will make the scent last longer. Once you've mixed all the components together, store the potpourri in an airtight container and keep in a dark location for 6 to 12 weeks. During this time, make sure to shake the container every so often to make sure that the scents incorporate well into the potpourri. It's easy right? With this bunch of ideas, not only will you save money on your Christmas crafts but you can also save some money on crafts for the rest of the year. Pot pourri. - Potpourri is as popular not only for its beautiful color and texture but also for its fragrance. Many shops now carry a good choice of reasonable priced of potpourri. But it is easy to make your own mixture with flowers and foliage from the garden or ready dried material from the shops. Pomander Balls - Combine the spicy fragrance of cloves with the tangy sweetness of citrus fruits to produce a wonderful aromatic and decorative objects. For a calming winter bath, you will need this one - Aromatherapy Bath Recipes - Peace of Mind Bath Salts. This calming winter bath salts is a wonderful gift to sent your neighbour or coworkers!. It is inexpensive to make but has a lots of benefit.